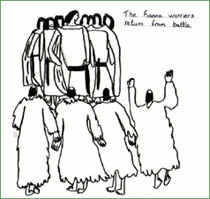 Artwork and story research by Ollie Carroll & Billy Bulfin, Coolderry National School, County Offaly, Ireland. The Fianna lived many hundreds of years ago. Every man of the Fianna was chosen for his strength and bravery and was specially trained in warfare and was made a champion among warriors. While standing in a hole as deep as his waist he had to be able to defend himself against nine warriors using only a shield and a hazel rod. He had to escape from nine warriors by running through the forest without breaking a twig under his feet or tearing his clothes on bramble. He had to be able to jump over a branch as high as himself and run under another as low as his knee. While running at top speed through the forest he had to be able to pick a thorn from his foot without stopping. He had to learn twelve books of poetry by heart and also know many of the old legends and stories. Not to take a dowry with a wife. This band of warriors were sworn to fight for the high king of Ireland and to keep the peace among the sub-kings of Ireland. When there was peace they lived lives devoted to the chase, for they were great hunters and food was never in short supply because in that time Ireland was heavily wooded where the boar, the deer and the wolf roamed in plenty. The Fianna hunted with their famous dogs – the Irish wolfhound, as large as a small pony and now, alas, almost extinct. In a single day’s hunting it is said that they would go from Killarney, in County Kerry, in the west to Ben Eadar in the east, near where Dublin stands today, crossing the trackless bogs and forest and climbing the mountains’ slippery sides. A wet or a fine day, winter or summer, were all the same to them, for they heeded neither wet nor cold.